Criminal Propaganda of Omission seeks to conceal the fact that the West and its terrorist proxies do not seek peace in Syria, nor do they seek to safeguard civilians. Agencies such as Amnesty International, and all of Western mainstream media (MSM), have devolved to the status of being vectors for war propaganda. The situation in Eastern Ghouta, Syria provides an exemplary template to demonstrate this strategy of criminal war propaganda. MSM obliterates from their White Helmets and SOHR – fed narratives the reason for the campaign against the terrorists in Ghouta. Just as the media erased the victims of the majority of citizens in Aleppo who were being daily bombarded by terrorists in East Aleppo, so too has the messaging erased the causal factors which have provoked situation in East Ghouta: terrorists violated UN SC Resolution 2401 by attacking those who sought to leave via pre-arranged “Humanitarian Corridors”. They shot people attempting to leave, and they bombed the humanitarian corridors — just like they did in Aleppo. When core elements such as those above are omitted from MSM narratives, the narratives devolve into fabricated war propaganda, totally devoid of any other purpose. In the following twitter post, Amal Saad demonstrates the lie. In the first AP article, terrorist Mohammad Alloush of the Army of Islam publicly states that only occupiers and “Assad’s regime” will leave (and hence civilians will stay) during a “Humanitarian pause” while the subsequent extract suggests that civilians independently chose not to leave. 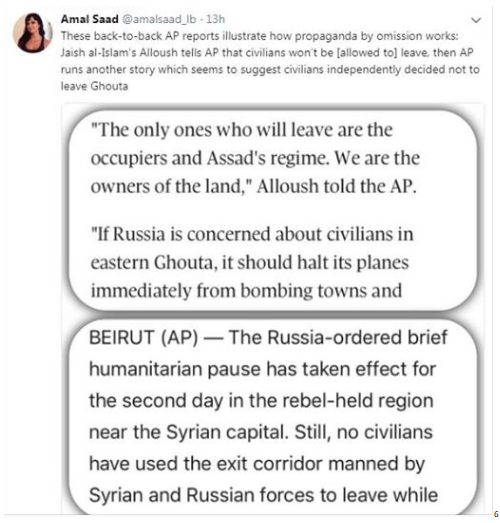 The AP messaging perpetuates the deception that citizens choose not to leave Ghouta (and therefore must be happy living in terrorist-controlled areas) just as it conveyed the same lies when Aleppo was besieged by terrorists. 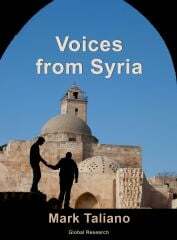 Obliterated from the messaging is that all of Damascus is being held captive by the terrorists’ bombs, that civilians in Ghouta are being used as human shields, and that the terrorists themselves are agents of the West whose presence in Syria is and always has been illegal according to Nuremburg standards. Tim Anderson, “Syria: the human rights industry in ‘humanitarian war’ .“ Centre for Counter Hegemonic Studies Research Paper. January 2018. (https://counter-hegemonic-studies.net/wp-content/uploads/2018/01/TA-hum-war-18-1.pdf) Accessed 2 March, 2018. “Who are the US, UK and France trying to protect in Eastern Ghouta?” offGuardian. 21 February, 2018. (https://off-guardian.org/2018/02/26/who-are-the-us-uk-and-france-trying-to-protect-in-eastern-ghouta/) Accessed 2 March, 2018. RT, “Terrorists open fire on 100s of civilians trying to flee E. Ghouta in Syria – Russian MoD.” 28 February, 2018. (https://www.rt.com/news/420080-ghouta-civilians-terrorists-syria/) Accessed 2 March, 2018. Pierre Le Corf,(https://www.facebook.com/pierrelecorf/videos/10156487796069925/) Accessed March 2, 2018. Eva Bartlett, “Aleppo: How US and Saudi-backed Rebels Target ‘Every Syrian’.” Mont Press News. 29 November, 2016. (https://www.mintpressnews.com/aleppo-how-us-saudi-backed-rebels-target-every-syrian/222594/). Accessed 2 March, 2018. Second extract: “No civilians exit Syria rebel-held region on day 2 of pause.” AP 28 February, 2018. (http://uk.businessinsider.com/ap-no-civilians-exit-syria-rebel-held-region-on-day-2-of-pause-2018-2) Accesse 2 March, 2018. Vanessa Beeley, “Mainstream media is lying – Residents of Ghouta are being slaughtered by Western-backed Al Qaeda.” Sputnik, 22 February, 2018. (https://www.sott.net/article/378211-Vanessa-Beeley-Mainstream-media-is-lying-Residents-of-Ghouta-are-being-slaughtered-by-Western-backed-Al-Qaeda) Accessed 2 March, 2018.